Tears fall from my eyes as I am writing this. 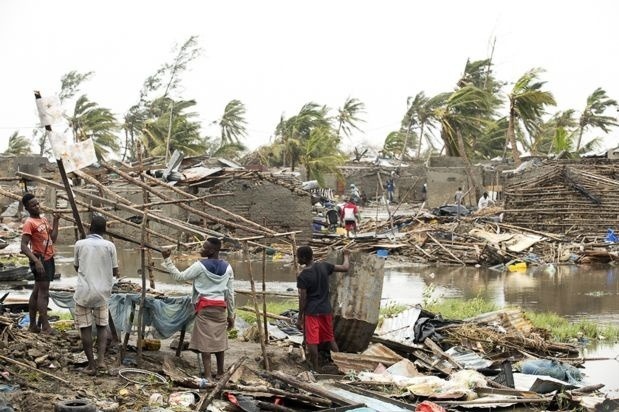 Beira in Mozambique, the city where I am from and where most of my family lives were hit by a cyclone (hurricane) last Thursday. Since then, there is no electricity, drinking water, food, and phone service. I stayed for five days without knowing the true state of my family. Today, I was able to speak with my mother, and she told me that part of the roof of my house is gone. To add to all of that, it is still raining very heavily in the city. My friend Estela could not locate some of her family members for six days since their house collapsed, and they were not in the government camps. My friend Yuma also could not get hold of her family, and her family’s house is also in devastating conditions. The three of us are probably the least affected ones out of the 1 million people who were impacted by the catastrophe. Most of them completely lost their houses and are currently living in roof-less schools with no condition for survival. Part of the Hospital of Beira, one of the biggest in the country, collapsed and the surgery bloc is still not working properly. Besides that, there are no stores, pharmacies, banks or any other essential facility that is functional. It is as if Beira no longer exists. I will fly to Mozambique and I will mobilize young people from our hometown to get together to help to organize families that are staying in local schools, spreading information about resources in the city (since there is no information source), and cleaning the city. In addition, these groups of volunteers will also help to receive and to distribute food and other supplies to families in need. We have contacted the World Food Program and the Peace Corps, and we will be executing our activities under their supervision. Yuma and Estela will stay back. However, they will be in touch with me so they can get updated information about the situation on the ground. Then, they will reach out to different organizations to seek for help and update you about how we have been using the donated funds. For now, we JUST WANT THE FAMILIES TO SURVIVE. A simple donation can keep a family alive. I am leaving tomorrow and I am handing this cause to you. Please, find more information about the cyclone below. Once again we would like to thank you for all your support. The campaign is trending and that warm our hearts. As explained before, we were not expecting such success. That is why we aimed for that first goal. However, now we are motivated to continue the campaign so that more people can be benefited from it. There are 400,000+ people that are displaced(USAID). Soon we will be sending updates of the work that Naira will be directly leading on the ground. We would like to express our gratitude towards each one of you who took the time to support us. When we started, we did not believe that the support could be this huge. We are blessed to have a group of kind people who are open to support and help. What happened in less than 24 hours made us believe that together we can do more and help more people. Therefore, since there are still so many victims, we are increasing our goal because. Words are not enough to describe how important all your donations are for us. Thank you so much for donating, sharing with your friends and family, for praying for us, and above all of that for believing in this cause. This means a lot to all the people who were affected and it will put a smile on many people's face.